The welcome reception will take place on Tuesday, 6th June 2017 following the afternoon sessions. At 6 pm you will be welcomed with a glass of sparkling wine in the „Dülfersaal“, one of the university’s banquet halls (building M13 Campus navigator). Following a short welcome address by the rector of the university, you are invited to enjoy a barbecue buffet. Parrallel to this, the EEM poster session will take place in the architecture-awarded Atrium of the building. The reception offers an excellent opportunity to meet new people, old friends and to connect with fellow colleagues. The band Leyenda Latino will frame the evening with live music. From 7 pm there will be the opportunity to test drive with VW’s e-mobiles. A pre-registration is mandatory (the registration for test drives is possible until 22th May 2017). Registered drivers must also present valid passports and a driving licenses that are valid in Europe! Please register to attend by using the registration form. If you plan to be accompanied by another person please submit a regular registration at our registration page. All participants are required to present their own welcome reception ticket. The dress code for the event is „ business casual“. Entrance to the event in building M13 via Helmholtzstr. 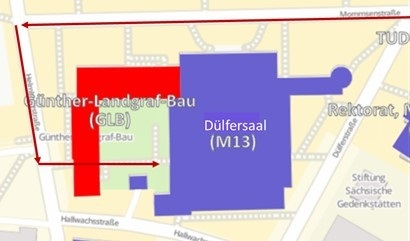 (passage through Günther-Landgraf-Bau GLB). For a more detailed overview please use the TU Dresden Campus Navigator. The EEM Gala Dinner will be held on the evening of Thursday, 8th June 2017. We are happy to announce that this event will take place in the „Gläserne Manufaktur“. This unique exhibition space owned by Volkswagen currently serves as a showcase for electromobility with plans to convert the facility to accommodate the future production of premium class and electric vehicles. We look forward to welcoming you to the Manufactory between 5.30 pm and 5.45 pm with a champagne reception. Participants will then be invited to take part in exclusive guided tours to experience the Volkswagen exhibition with a focus on electric mobility and their production facilities. Please register in advance for one of the two guided tours: Tour 1 (6 pm-7 pm) or tour 2 (7 pm-8 pm). Please use the regular registration system of the conference. Those interested in experiencing electric mobility first-hand will be afforded the opportunity to take a short test drive in an electric or a hybrid vehicle. Pre-registration is mandatory (EEM registration system)! Do not forget that those wishing to take a test drive must bring their valid passports and a driver`s license that is valid in Europe! Without these documents VW cannot permit you to operate a vehicle. The registration for test drives and guided tours is possible until 22th May 2017. Please register soon. This unique reception will be followed by a short welcome speech from Dr. Carsten Krebs (VW Manufactory Dresden) and a four-course dinner in the Manufactory’s Orangerie. The awards ceremony, where the best conference papers will be recognized, will mark the end of a wonderful Gala evening. The evening is musically framed by the excellent students of the Saxon State Academy for Music (Sächsisches Landesgymnasium für Musik). Vegetarian meals are available. To request vegetarian or any other special diet food please inform our conference agency KIT (at the latest by 22 May). Please note that only participants registered to attend the event will be granted access to the venue. All participants are required to present their own dinner ticket.